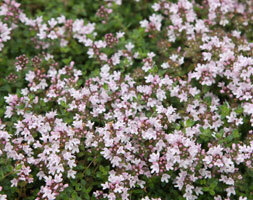 This mat-forming thyme produces a mass of clear pink flowers in summer. It&apos;s an ideal ground cover plant for a sunny border or rock garden. Useful for attracting bees and other beneficial pollinating insects into the garden, the aromatic grey-green leaves release a lovely scent whenever they are trodden on.